even though I may be astutely dying on the vine. who I read today, had wretchedly passed away. to stop decaying amid your cerebral acclaim. but you’ve got nothing left to say. Poet Lawrence Ferlinghetti‘s 96th birthday rolls around on March 24, 2015. Let’s get a head start on celebrating this iconic author’s nativity by paying homage to his classic poem “I Am Waiting,” which first appeared in A Coney Island of the Mind — Ferlinghetti’s 1958 collection that, with over a million copies in print, is one of the most popular books of poetry ever published. PROMPT: The trigger for poems in this series is “waiting.” What are you waiting for? Christmas? A new job? New home? New baby? Happiness? A trip? Godot? 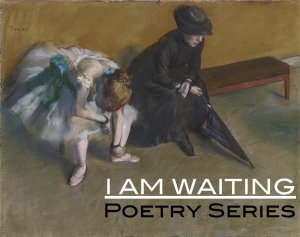 Whatever you’re waiting for, memorialize it in your “I Am Waiting” poem. If we get enough submissions, we’ll create a book of the poems as a big, beautiful birthday card for Mr. Ferlinghetti.